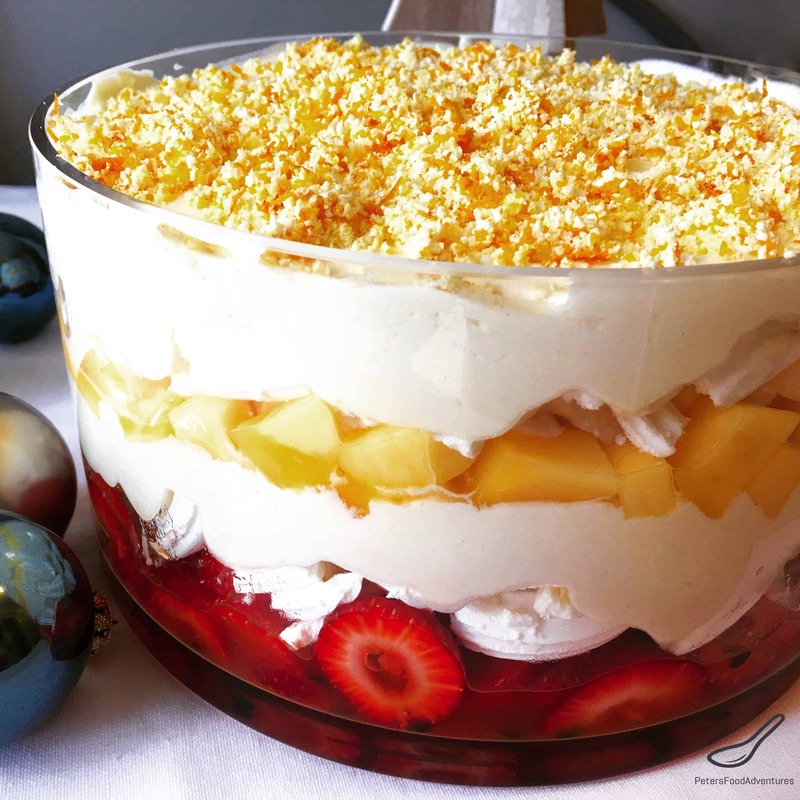 This Easy Pavlova Trifle Recipe is a holiday favourite around our home. My wife has been making this delicious treat for almost 20 years now. It uses elements of a traditional Pavlova dessert, but it’s easier and quicker to make. Pavlova is a meringue desert topped with cream and fruit, named after the famous Russian prima ballerina Anna Pavlova. The dessert is believed to have been created in her honour during her tour of Australia and New Zealand in the 1920’s. It’s hotly debated if Pavlova is an Australian dessert or a New Zealand invention. Pavlova is a baked Meringue topped with fresh fruit, usually strawberries, passionfruit, kiwi, mangoes and cream. I made a festive Pavlova Wreath topped with raspberries and blueberries which looked amazing, but this Pavlova trifle recipe will save you so much time. A great thing about living in Australia is the availability of meringues available to be bought in a grocery store. When we lived in Canada, we baked the Pavlovas from scratch, which doesn’t make for a quick and easy dessert. But what I discovered is that smaller meringue nests are commonly sold in grocery stores everywhere, ready to go when making quick desserts. Meringue nests are crunchier than a regular Pavlova base, providing a great contrast with the fruit, cream and yogurt. I love how the mixture of silky Vanilla Bean yogurt and cream tastes with the fruit and crunchy meringue. My wife has been making this dessert for over 15 years and it’s so tasty. She says if you don’t have Grand Marnier, just squeeze 2 tablespoons of orange juice from the orange you are going to zest into the strawberries instead. Don’t overdo the orange, you only need a slight hint of flavour, the orange zest will do the rest. Trifle dessert is an English invention, with cream, custard and sponge, dating back to the 1500’s. When I think if trifle desserts, I think of an old fashioned dessert, still stuck in the 1970’s, and not the good kind of 1970’s! 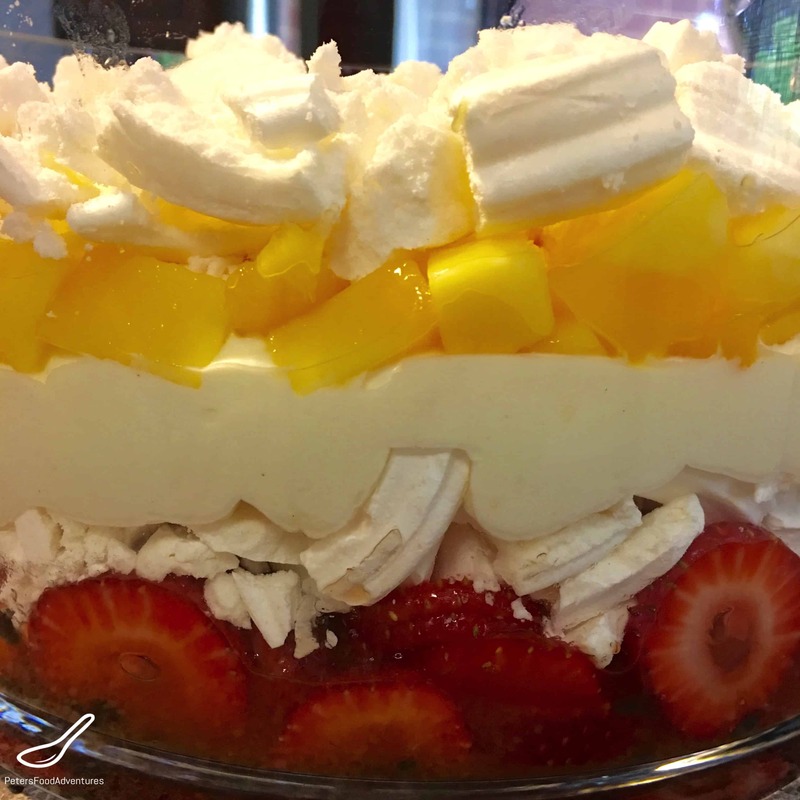 This Easy Pavlova Trifle recipe takes the best of both desserts, and combines it together into an easy to make delicious dessert. Growing up in Canada, I never knew how to cut mangoes. There is an easy way to cut mangoes into cubes. 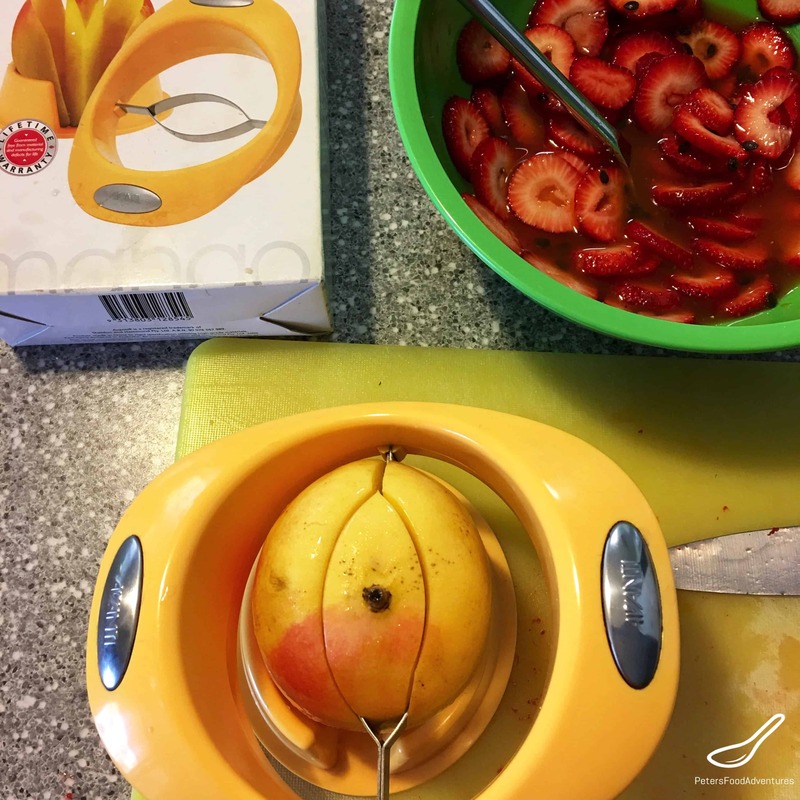 I use a mango slicer to slice the cheeks away from the seed, then cut the pieces like a Tic Tac Toe board. 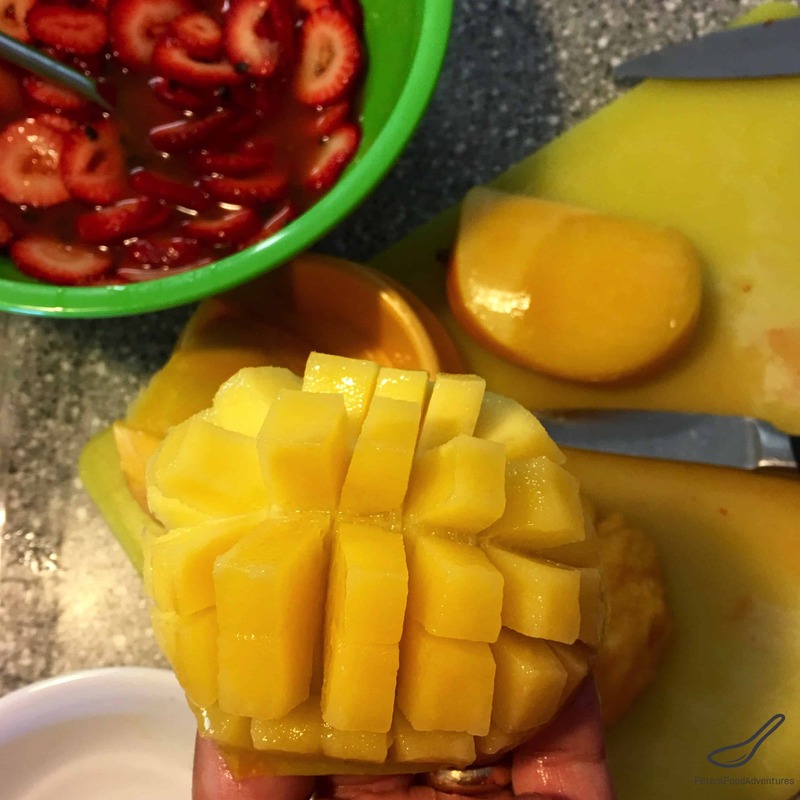 Invert the mango cheek and remove perfectly cut cubes. It’s a time saver and less messy. Who needs the same old dessert? 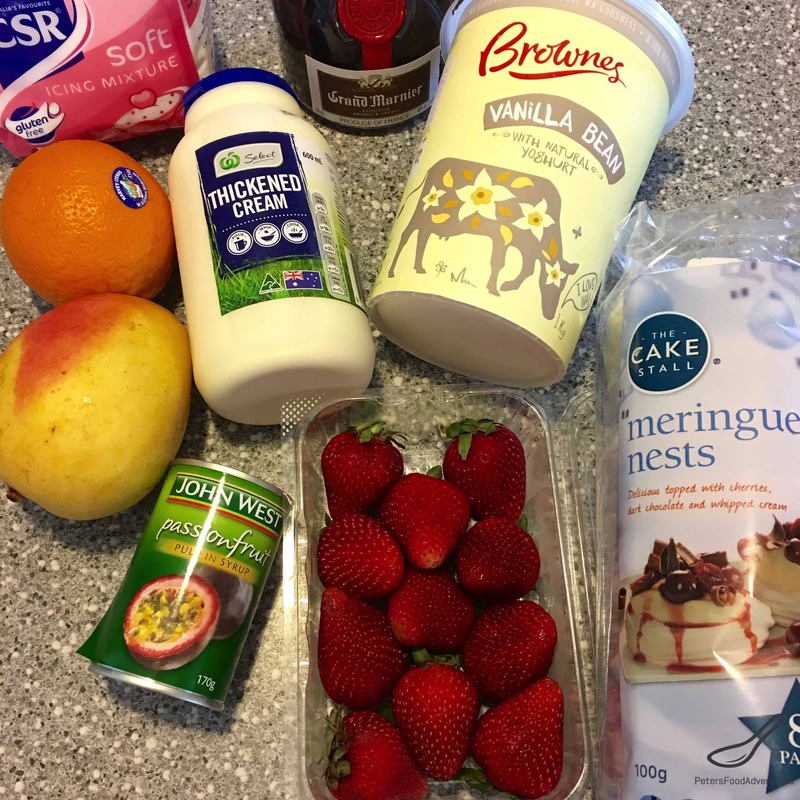 For something a little bit different this year, everyone will love this Easy Pavlova Trifle Recipe a try. Bon Appetit! Приятного аппетита! 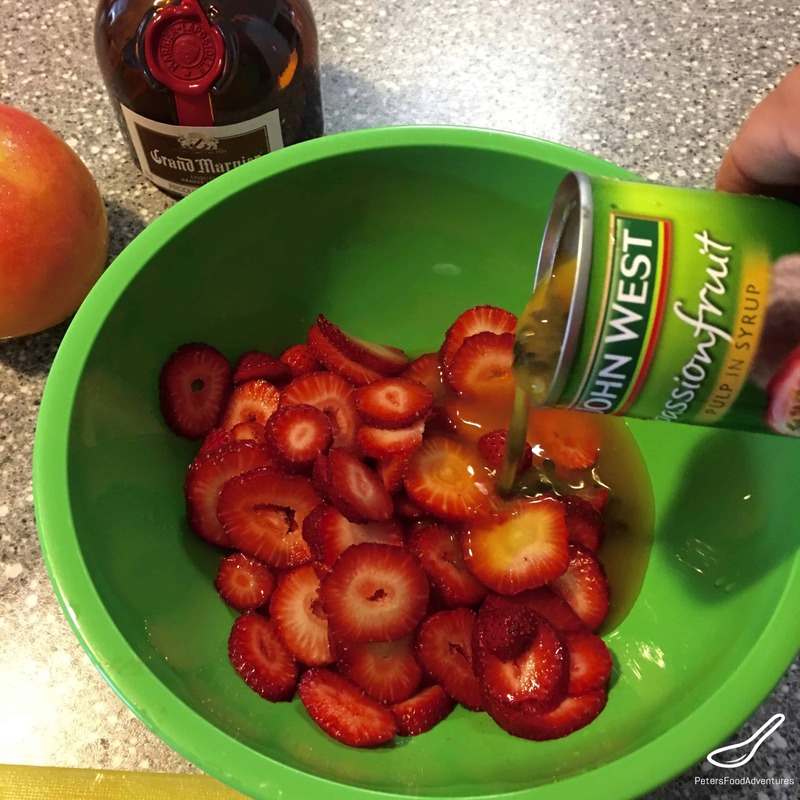 Mix the strawberries, passionfruit and Grand Marnier in a bowl. Set aside to marinate together. Beat the whipping cream and 6 tablespoons icing sugar until peaks form. Carefully fold in the Vanilla Bean yogurt into the whipped cream. Mix carefully maintaining the 'fluffiness' of the whipped cream. Using a large glass trifle bowl, layer the strawberries, followed by a row of meringue and then covered with a row of Vanilla Bean cream. Repeat with a second layer of sliced mango, meringues and cream. Grate white chocolate and orange zest. Mix them together in a bowl and sprinkle the top of the Pavlova trifle before serving. Serve immediately. If you don't have mangoes, you can substitute with a few sliced bananas. Keep the white chocolate refrigerated until you are ready to grate, this will make it easier to grate. The white chocolate zest will melt when you mix it with the orange zest, so mix it quickly not allowing it to clump together. Remember to serve immediately, or the dessert will go soggy. Wow does this look yummy! Thank you. Skimp on Christmas dinner and save room for this dessert! This will be on my table on the 25th! Haha! Definitely need to save room for this!!! ??? ?